Feb 9 Big Review Tv: Deborah Selleck Reviews! 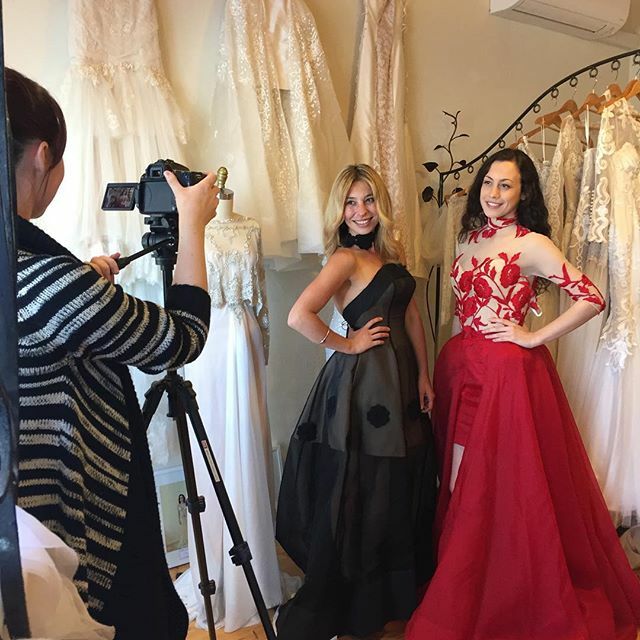 Recently, our Yarraville wedding dress studio was visited by Bessie Kay of Big Review Tv! Feeling every inch the celebrity, we showed Bessie around our bridal gown studio and chatted to her about Deborah's couture wedding dress designs! Of course, Bessie did not miss the opportunity to try on a few of our couture wedding dresses, and who can blame her? Our studio is always a luxe paradise of European lace, pearl details and of course, racks of designer wedding dresses! Watch the video above to see behind the scenes in our bridal gown studio, and to see what Bessie had to say in her Deborah Selleck Review! And here are some behind the scenes shots from the day! Model Lillie Anna wears our Peony Rose scarlet red wedding dress, which walked the runway at Fashion Palette New York Fashion Week. While, Bessie wears our 60s inspired black wedding dress design, which also debuted at New York Fashion Week. Such a fun day of playing dressup and talking fashion! Thanks to Bessie Kay and Big Review Tv.